The renowned German vehicle manufacturer Liebherr has introduced a brilliant grab for the mobile harbor cranes. This smart grab has been named as Smart-Grip that is said to have the ability for boosting productivity over twenty five percent. The company has launched a game changing technology that functions as a smart system that has the ability of optimizing the rate of grab filling in an automatic smart way. The smart-grip offers a variety of benefits such as zero overloads and exceptional performance. The new technology introduced by Liebherr functions intelligently for increasing the filling rate and helps in avoiding overloads and saves on hardware. Conventionally, just seventy percent of the capacity of the grab is utilized because of sup-optimal angles of the grab and a material density that varies frequently. 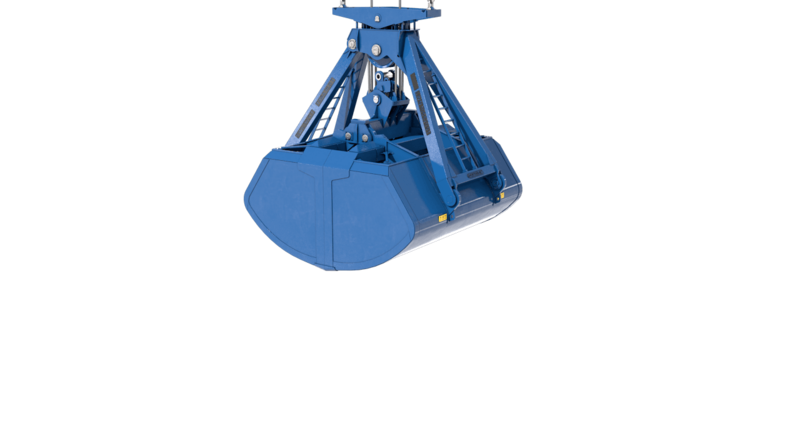 Attempting to get the 2 in the right way must be a tough challenge for the operators and demands a collection of various grabs to serve to different kinds of materials. Because of extensive and keen analysis, the company strived hard for bringing up the perfect model of grab-fill for a variety of material densities for optimizing the filling rates. The latest high tech system also includes an automatic component that adjusts the behavior automatically to suit the compression, bulk density, and granularity and other related criteria. When the grab moves through the first few cycles of load, the filling is optimized automatically from seventy percent to the maximum capability available keeping in view the size of the grab, the load of the crane along with out-reach. The company states that the intelligent system can achieve the maximum rate of the grab filling in the initial 7 cycles. This system also works for preventing the overload which can result at the time of pulling load at the grab of a sticky kind of material. This leads to the overload of the crane and leads to shutdown of the pending work unless the system is reset. The mentioned special feature improves productivity on one hand and extends the longevity of the crane on the other hand by attempting to avoid the stress resulted by the sudden overload shutdowns and saves time and fuel. The smart-grip avoids overloading automatically and besides this the crane has the feature of manual operating and can be operated for different kinds of loads in a manual way. If an operator of the crane wants to load forty ton truck for instance, he can manually set the system to fill the grab up with forty ton. Isn’t it amazing? The intelligent system might also be utilized for cranes manufactured by Liebherr in old times. The installation of the system has been previewed to be simple, easy, and quick. Smart-grip is the ideal solution for optimizing grab filling rates. Liebherr has collected in-depth data and has done keen analysis and because of this the company has managed to deduce the ideal grab fill model via data mining. The system adjusts automatically and recognizes the bulk density and compression itself. It recognized the current frame conditions as well including the impression depth and kind of grab. The system makes sure that the grab fill rate is above seventy percent. Within 7 cycles, the grab’s total capacity is utilized. The Dijon based Joly location has received the first Ruthmann T720 truck in France. This would be the first Ruthmann truck to be delivered in the country. The latest machine was taken for job in the Dijon’s historical central district where it was set to work on a 5 star hotel situated next to the Grand hotel de la Cloche in the city center. The building was established between year 1881 and 1884 and was protected from demolition in the 1970s when an order for preservation was placed on the walls and façade. The new lift was simple and easy to work on the whole of the façade and the roof from one single position. 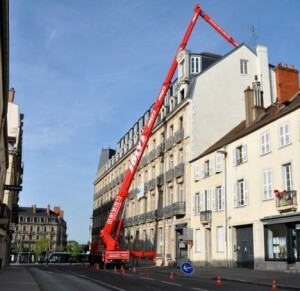 The lift’s long telescopic job let to reach to the hotel at the back of the building where it performed repair and maintenance over the roof slates and gutters. The lift had the ability to work on the front and back of the hotel. After the work was done, the lift was moved towards Paris and was set to work on Brest. This amazing machine has been mounted on an 8 into 4 by 4, has one axle on the front and 3 axles at the rear. Axle one and axle 3 are the steering axles and axle 2 and axle 3 are the driving axles. The wheelbase is a bit short that 4.5 meter instead of 5.1 meter. Because of such measurements, the turning radius is way better as compared to any similar combination. Moreover, in rough terrain, the driving axles provide the driving power right at the point where the load is for exceptional traction. The front over hang is less than two meters. The T720 is the latest addition to Ruthmann’s height series offering flexible access in odd situation. All credit goes to its extended telescoping with moveable jib. The model has a working height of seventy two meters and has a maximum lateral reach of thirty eight meters. The design shows that the operator would have 21.4 meter reach at a working height of sixty eight meters along with a hundred kilogram cage load. The Ruthmann T720’s flexibility lets the work to be done behind awkward obstructions including pipes, building fronts, and wires and cables. With the help of this model work can also be done at depths measuring up to twenty meters below the surface. All thanks goes to the jib system and the telescoping and rotating of the cage. The T720 is designed to offer customers the advantages of extended length. The operators now get additional 5.5 meter of upper boom length as compared to other models in the series. A new feature incorporated in the model is that 4 outriggers can be manipulated individually from the back on both sides of the vehicles. This feature is added for providing better decision making while jacking and increasing safety on the site. The simple and easy positioning of the outrigger pads also results in decreased set-up time. The Ruthmann T720 has compact and precise dimensions with a total length of only 13.7 meters. More information about cranes, hoisting and rigging services.